By joining figure and landscape, we are again led to consider place. Like Google Street View, the postcards Stezaker incorporates into his images are a predecessing media for transmitting images of the landscape. This synergy seems to be suggestive of texture, as a visually impaired person might experience another’s features through touch, translated into a visual image. Similarly the film industry is a mass media image distributor. Through Stezaker’s intervention we are left to imagine the facial expression and consequential action of both characters and actors, and how these might differ. Like Chu, Manuela Barczewski, who is included in the Salon Photography Prize exhibition, constructs scenes to capture, but on a more human scale, using largely recycled materials. A significant link between the two is use of boldly patterned wallpaper. Through the use of found materials you could perhaps relate Barczewski’s work to that of Tony Cragg, but this is much more undefined and open to interpretation. Maybe a better comparison would be with Anthony Caro‘s sculpture given the combination of large flat surfaces. Barczweski’s scenes seem to depict an experimental process of interior design, comparing and contrasting colours, materials, patterns and textures. Indeed, perhaps the process of making the work is the focus, the main subject matter, as discussed of Simon Starling‘s work by Alistair Sooke on BBC2’s The Culture Show (Episode 18, 10/02/2011). Whilst focusing upon construction, there is also a crime scene aesthetic (as discussed by Roland Barthes in Camera Lucida) present in the Shifting Around series, where things don’t seem quite as they might be. A blind on the floor, an upside down stepladder, shelves sideways on the floor and a headboard without a bed, whilst one image has one chair on its side and another on its back adjoining different architectural surfaces. Has something violent occurred, or are we in an alien world without gravity, in which multiple directions of horizontal and vertical living are possible? In essence it seems that the availability of photography today is causing some photographic artists to look beyond the viewfinder and use their imagination to create images physically rather than capture the world around them. Chu YinHua is being exhibited at The Mews Project Space in an alley off Osborne Street behind the Whitechapel Gallery. 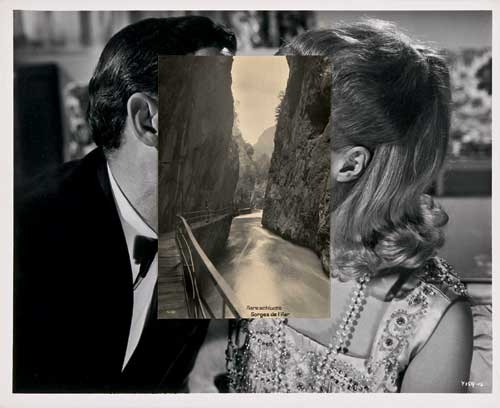 John Stezaker is on show at the Whitechapel Gallery until 18th March. Manuela Barczewski is included in the Salon Photography Prize exhibition at Matt Roberts Art, Unit 1, 25 Vyner Street until 26th February.